Learn more about Docker Compose, how it's different from Fig, and how to use one YAML file to start Mesos. When compose was released, I tried it and was a bit underwhelmed, as it is basically a relooking of Fig. This is not unexpected as Docker Inc, acquired Orchard the makers of Fig. But I was expecting more added functionality and even a tighter integration with the Docker client (something a devbranch actually prototyped), even a common release instead of a separate binary. I am sure this will come. As I am writing the docker cookbook, I have deployed Wordpress 20 different ways, and it's getting a bit boring ! I was looking for more information on Mesos and its support for Docker, I re-read a terrific blog post that showed how to start a Mesos setup (zookeeper, master, slave, marathon framework) in 7 commands. Can't beat that. When I re-read this post, I automatically thought this was an exciting use case for docker-compose. 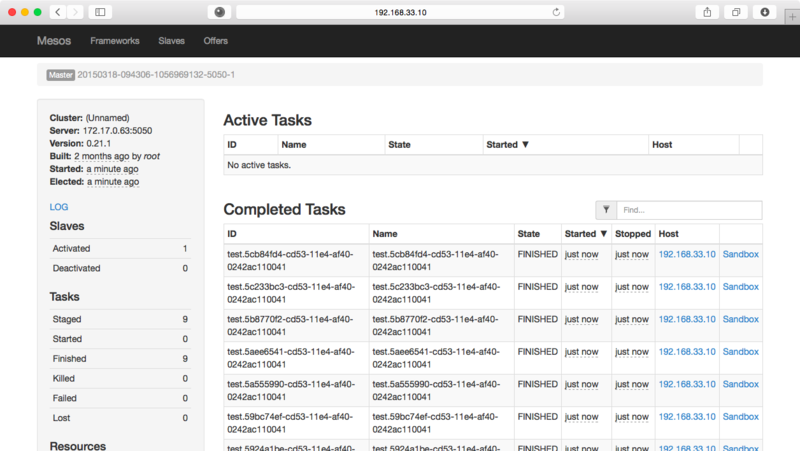 One YAML file to start Mesos/Zookeeper/Marathon and experiment with it. Of course I am not talking about a production multi-node setup. I am just looking at it for an easy Mesos experiment. I will spare you the details of installing compose (just a curl away). The dockers docs are great. Bottom line, I went from '7 commands to Mesos' to '1 command to Mesos' thanks to Docker-compose and a fairly simple YAML file. Got to love it. When compose can do this across Docker hosts in a Docker Swarm started by Machine. Then the real fun will begin !